Alibaba Group Holding Limited called BABA on Nasdaq is at $94.165, this means a growth of +38.48% in just a couple of hours !! QQ is still leading the top position. Weibo is still used but WeChat is likely to be used more extendly in 2015 because more and more Chinese are using smartphones to access social media. After doing financial services, insurance, now Alibaba decided to invest in big data services: Alimama is an Alibaba marketing platform. The firm held a meeting to discuss big data’s influence on marketing transformation. Alimama wants to build a technology-driven big data marketing ecosystem, making more people to use and share data therefore achieving media advertising value and brand marketing effect. The marketing system centered on DMP (Data Management Platform) will improve enterprises’ data usability more effectively. Precision marketing brought by big data would optimize media advertising value continuously. In 2014, Alimama will focus on developing video and wireless resources, wireless marketing will be integrated into game, weather, food and drink and photo apps without interfering consumers. Alimama becomes a crucial link in Alibaba’s O2O wireless marketing plan. With the deal, Facebook enlarge its user base in countries in many countries and particularly in Brazil and India where Whatsapp is very strong. Owning the messaging service will give Facebook access to additional data. Facebook will get more information & data on users in emerging markets thanks to the acquisition: Whatsapp is more popular than Facebook in Brazil, India & Mexico. With the acquisition, Facebook aims for better engagement with users, in particular in emerging markets. If Facebook succeeds in maintaining and building high user engagement with WhatsApp, it could drive those users to Facebook where they will see ads, potentially targeted with data enriched by WhatsApp use. For now, WhatsApp promises the service will remain free of advertising. In a February 2014 blog post, the firm reaffirmed its policy: “And you can still count on absolutely no ads interrupting your communication”. However, WhatsApp’s terms of service in the Android ecosystem requires users to approve access to lots of other types of information including geographic location, contacts stored on the phone, personal profile data from contact information, and device ID. Apple iOS users are asked to approve collection of contacts and allow push notifications such as alerts. The main piece of data WhatsApp needs to enable its service is a mobile phone number. Facebook can use this piece of data for its services like Facebook and Facebook Messenger. Facebook may be interested in determining degrees of closeness among people. Many people have submitted their mobile phone numbers to Facebook and the firm could connect that information to data from WhatsApp to learn more about which users interact more often with one another based on how frequently they are in contact on WhatsApp. The coming months should be very interesting. In 2011, WeChat (微信 in Chinese) started off as a messaging service, similar to WhatsApp but with more functions, and has grown rapidly into much more. We already explained that year 2014 will be the year of monetization for WeChat. At the moment, the application allows companies to send occasional, targeted messages to some users without charge. In the future, VALUE2020 predicts it might ask for a fee. The application integrates money-making services like online-payment functions into it. Customers can do their banking through it and a wealth-management service has just been launched. It is also promoting e-commerce: during a recent sale held exclusively on WeChat, Xiaomi, China’s hottest smartphone-maker, is said to have sold 150,000 of its latest model in under ten minutes. WeChat payments are accepted in locations all over China. For example, you can find vending machine using WeChat. Instead of using cash to pay, the buyer opens WeChat and points its smartphone camera at a QR code. The app then reads the QR code, and charges the WeChat user for the price of the product. Then the product comes out. We can say this Chinese application is the most advanced messaging application in the world. 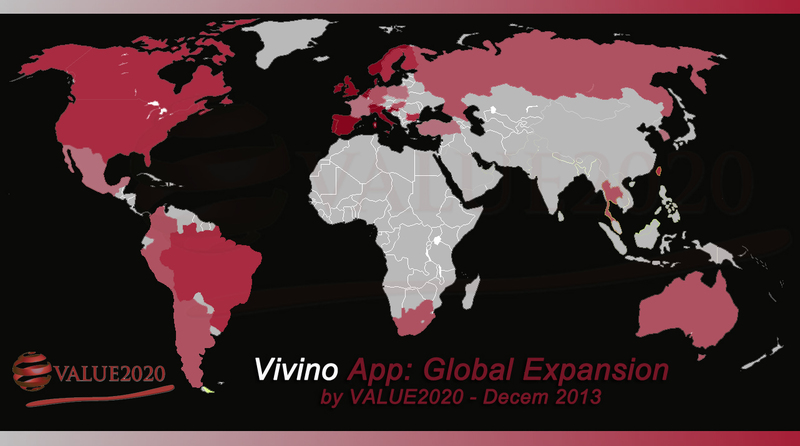 The VALUE2020 predicts that year 2014 will be the Year of Monetization for Chinese mobile application WeChat. In addition to exclusive sales on WeChat like the operation for Xiaomi smartphones, WeChat added in 2013 a store to buy stickers, and above a payment system which open the door to mobile commerce as expected by VALUE2020 back in 2011. Last year, we predicted the introduction of mobile payment and continuous growth. Almost all the predictions are reality today and next year will be fascinating as well. Released on iOS in January 2011, Vivino is a Wine App offering an easy way to remember wines you tasted as well as to discover new favorites. To find the wine in the database, you use the app to scan the label. It’s backed by a database of more than a million wines, so you can expect to get a match after scanning a wine label to add to your virtual cellar. The free app offers a $4.99 Pro in-app upgrade that unlocks several premium features. With Vivino Pro, you can keep track of your wine collection, find wines using text search, and get in the fast track for manual matching. 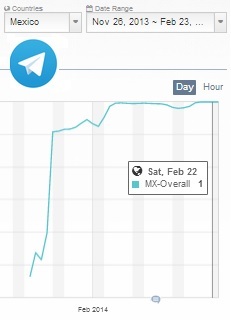 The mobile app experiments a growing traffic with an estimated 6 million scans for December 2013. Denmark, Belgium, Norway, Portugal, Switzerland, the Netherlands love the application but not China. There is no version in Mandarin Chinese therefore it explains the very low number of downloads and usage in Mainland China. In addition, content cannot be shared with Weibo followers or WeChat contacts.